Heart to Heart: Remembering Nainaji, a Biography of the singer Naina Devi by her disciple Vidya Rao was launched at Taramati Baradari during the recently concluded Hyderabad Literary Festival 2012.The book launch preceded a concert by Vidya Rao.Vasanth Kannabiran releasing the book gave a brief appreciation.Based in Delhi, Vidya Rao has studied Khayal and performs Dadra-Thumri songs. 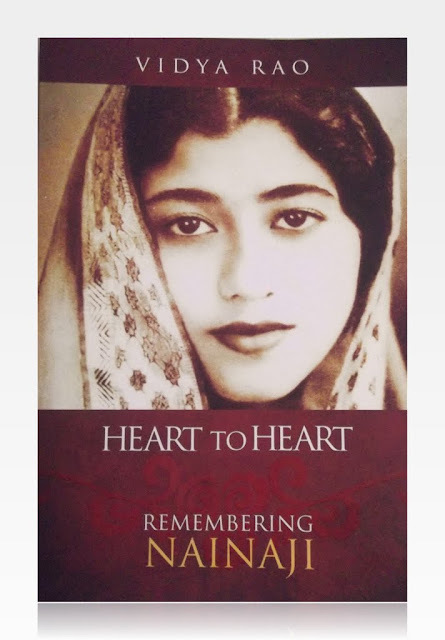 The biography is a delicate evocation of the Guru-Student relationship and every page glows with the deep affection and respect of Vidya for Naina Devi. Naina Devi is bewitched by the songs of the Courtesans of Awadh which she had occasion to hear at a young age and her precocious rendition at the request of her first Guru Girija Chakravarty whose nightlong concert she had listened to with rapt attention amazes and delights him.The book relates Naina Devis family background, close relationship with her sister,her knowledge of Sufi songs and philosophy,her poignantly brief marriage and rediscovery of herself through Music. Naina Devi headed an institution devoted to the rebirth of fine arts and various other posts.The singer Shubha Mudgal was one of her disciples.Her contribution to the preservation of our Musical Heritage by recording of legendary artistes is an especial highlight of her career and it displays her wonderful sympathy with colleagues.The concluding part of the book deals with her last days and the author's sense of the loss felt by her Gurus demise, though she consoles herself with the thought of her abiding presence.Concise, but filled with brilliant insights, this book published by Harper Collins allows us an intimately close glimpse of a great artiste's life and memories of a vanished era.